One of the highlight of this Sunday's birding trip with my birder friends was seeing a Baltimore Oriole at Kennesaw Mountain (KMT) Battle Filed Park in Marrietta, Cobb county. While most of us were searching for the spring migrant warblers, an expert KMT birder, Deb Zaremba (see Robert and Deb Zaremba's birding website at http://www.georgia-birding.com/) pointed a male Baltimore Oriole sitting on top of a tall tree near the open field to the right side of the parking lot. Most of us had a very good look at this bird through our binocular. Unfortunately, my camera could not take a clear photo of this bird due to the far distance. Interesting thing just happened to me when I came home at about 3:30 this afternoon (4/26). While opening my mail at kitchen table, one hummingbird's visit made me raise my head to watch my favorite bird (I can never get tired of watching my hummers). Suddenly I have noticed two fire red birds sat on our Hydrenagea tree (yes, my Hydrangea is over 12 feet tall). At the first half second, I thought they were "wash-colored" cardinals. I know there is no such a thing by calling a bird "wash-colored". 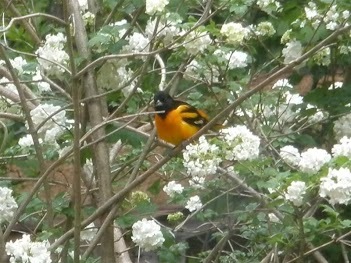 But, as soon as they turned their head towards me, I screamed "they are Baltimore Orioles"! And while I enjoyed their short visit, I quickly grabbed my camera (and in the mean time, praying and hoping they don't fly away while my camera is slowly starting up) and took few photos of them. They stopped for few minutes and one of the birds did his act (see video below), then took off and continued their journey to their final destination. I hope they will have a safe trip to their breeding ground. They are gone for now, but the image of them become a sweet memory within me forever. See my other birding clips here.